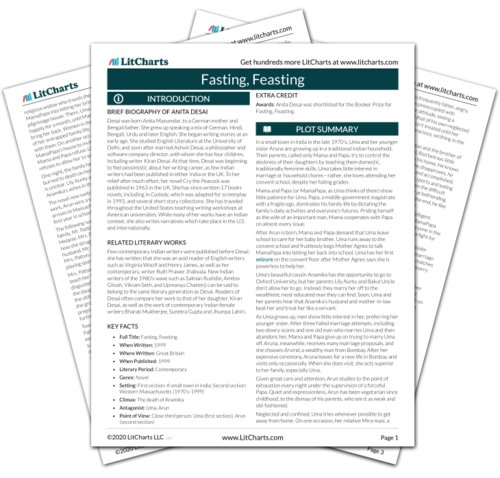 Instant downloads of all 942 LitChart PDFs (including Fasting, Feasting). 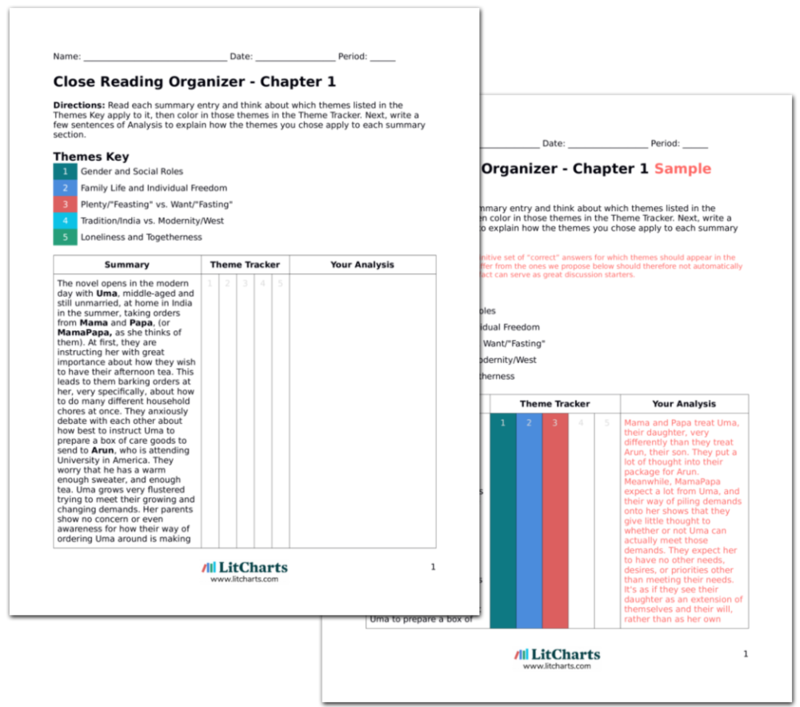 LitCharts assigns a color and icon to each theme in Fasting, Feasting, which you can use to track the themes throughout the work. Returning from work at the university library, Arun passes Rod, who handsomely jogs by, inviting Arun to join him. Arun turns him down, feeling embarrassed at his lack of athleticism. Later that night, Rod and Mr. Patton are on the downstairs couch, watching a football game and eating microwave taco dinners. Arun wishes he could join, but doesn’t feel welcome. Mrs. Patton, on the other hand, eagerly invites Arun to cook Indian food with her. Not knowing how to cook, he begins to mix together all the Indian-aisle ingredients Mrs. Patton bought. Melanie comes in and says that the food looks gross, and Arun agrees. He eats it anyway, to please Mrs. Patton. Later, he finds Melanie sitting on the staircase, eating Hershey’s. He asks why she hasn’t eaten, and she says it’s his fault for making disgusting food. He feels somehow it is his fault, and wishes he could help. Rod and Mr. Patton seem to Arun like intimidating, brawny, sports-obsessed American guys. While he wishes he could be included in their men-only rituals, he feels inadequate, left out because he doesn’t share their athletic world, or their culture. Even Rod’s invitations scare Arun because he doesn’t want to be face the possibility of ridicule. Arun doesn’t want to spend time with Mrs. Patton, because she silently demands that he make her feel like a good mother. Melanie’s accusation that she isn’t eating because of Arun makes him feel guilty, even though it is an illogical claim. His guilt comes from his own family, where his sister did suffer neglect because his parents were so focused on meeting his needs. Ballinger-Dix, Elizabeth. "Fasting, Feasting Chapter 21." LitCharts. LitCharts LLC, 7 Sep 2014. Web. 20 Apr 2019. Ballinger-Dix, Elizabeth. "Fasting, Feasting Chapter 21." LitCharts LLC, September 7, 2014. Retrieved April 20, 2019. https://www.litcharts.com/lit/fasting-feasting/chapter-21.